Infrared heat energy is a radiant form of heat. 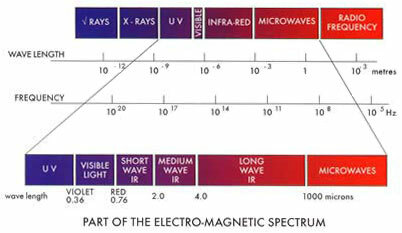 It is electromagnetic energy within a specific wave-band falling between visible light and microwaves. An infrared heat source has the ability to heat objects and people directly, without heating the air in between. Infrared heat energy is emitted by a hot body and transferred in straight lines, just like visible light, until it makes contact with a cooler body where the heat is absorbed by the latter, causing it to rise in temperature. As the temperature of the heating source is increased, so does the proportion of heat transferred by radiation. Radiation from Infraglo radiant burners falls into the medium wave region of the infrared spectrum, making it a popular and effective option for curing and drying applications. It is readily usable for flat surfaces and for intricate designs and shapes but you must take care with items of widely differing thickness. Infraglo infrared is a very widely used heating technique and finds application across the whole of the manufacturing industry. It is a technique which is becoming more widely used by the finishing industries. With our knowledge of infrared's attributes and how it heats materials, we can make significant improvements over conventional heating systems. Infraglo infrared: instant heat efficiently! Infrared is the heat element of sunlight, it does not have any UVA or UVB - that's the opposite end of the spectrum. It is used extensively for health appliances, to treat a wide range of complaints, and recently infrared saunas have been developed.